Following the sacred deer, the first people emerge from the serpent-filled underwater world in the west. Lighting their way with torches, they walk east toward what they will come to call Dawn Mountain. Once they reach the high ground, the deer that willingly led them from the abyss beneficently sacrifices itself. When the deer falls, its carcass suddenly blooms with peyote buttons. 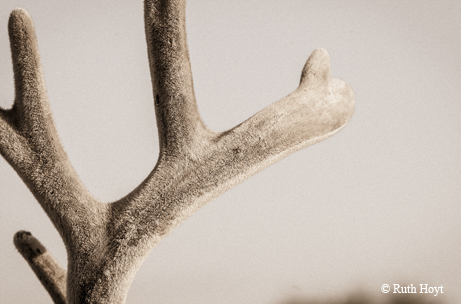 The vision-producing plant even grows from the tips of the deer’s antlers. Eating the deer, the people become gods and the world begins. Archeologist Carolyn Boyd, who directs the Shumla rock art research and education program in Val Verde County, believes that this creation myth, originally ascribed to the Huichol culture of northern Mexico but now thought to be much older than that, is recorded in ancient rock art near the Rio Grande. 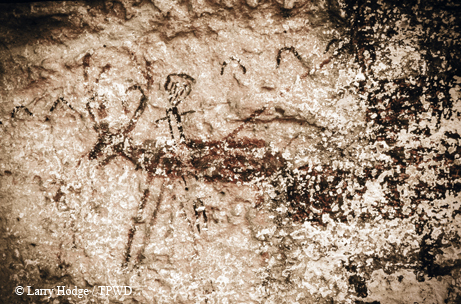 Paintings found in the high rock canyons of the lower Pecos River often depict deer figures and human-like figures wearing antlers. If not every culture’s view of cosmology, the roughly 4,000-year-old painting at the White Shaman site nevertheless represents the emergence of deer antlers as a cultural icon in the Southwest. 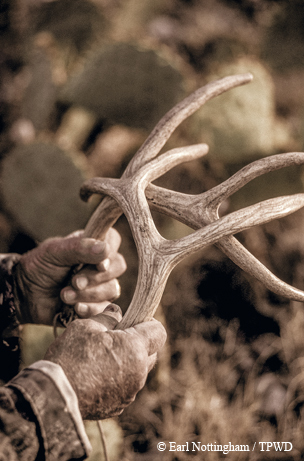 Somewhere between the take-a-deer-or-go-hungry days and the taming of the Texas frontier in the final quarter of the 19th century, the size of a buck’s rack became a matter of hunter pride and bragging rights. The formation of the hunter/conservationist group Boone and Crockett Club in 1887 by avid hunter and future “big stick” President Theodore Roosevelt happened about the time that hunting began its transition toward being more of a sporting activity than strictly a means to acquire meat on the cloven hoof. The club developed the numerical antler scoring system still used today. For hunter-gatherers, a deer’s antlers amounted to the Home Depot raw material section of the day. The heavy end of a deer antler made a good knife handle, and the sharp tines could be used as awls. Pieces of antler also came in handy for digging and flint-knapping. These days, deer antlers are used mostly for ornamental purposes. One hunter’s blog lists 51 things that can be done with antlers, the last (or should it be first?) being merely looking at them and remembering a great hunt. Some uses include: jewelry, buttons, drawer pulls, letter openers, wall hooks, lamp bases, dog chew toys and Asian medicine. ﻿Antler room at Kerr Wildlife Management Area outside Kerrville. In 1881, German-Texan Albert Friedrich tired of working for someone else as a bartender and bellhop and decided to go into business for himself. With adult-like promotional acumen, the 17-year-old Alamo City teenager opened a saloon on Main Plaza in San Antonio. He named it The Buckhorn. At some point early in that venerable establishment’s history (it’s still in business), young Friedrich had a great marketing idea. 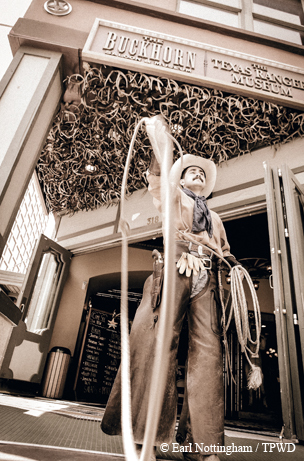 Since many of the cowpokes and others who came to town had little more than a change of shirts in their saddlebags and even less in their pockets, Friedrich came up with the notion of offering a free drink to anyone who brought in a set of antlers he could hang on the wall of his saloon. 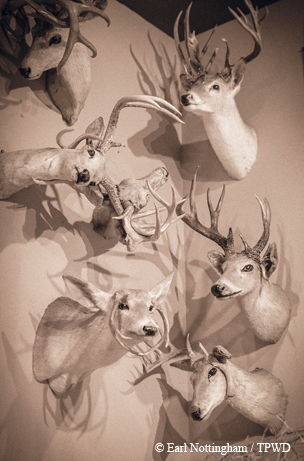 As word spread of this arrangement, the watering hole acquired a Texas-size collection of antlers that appealed to the growing tourist trade. Friedrich could have used a little help with nomenclature in naming his saloon. Horns and antlers are not the same thing - bovines have horns, and deer sport antlers. Horns consist of material similar to fingernails and grow on both males and females; antlers are made of bone and, with rare exception, are particular only to bucks. That said, the Buckhorn Saloon does have a better ring to it than Buckantler Saloon. 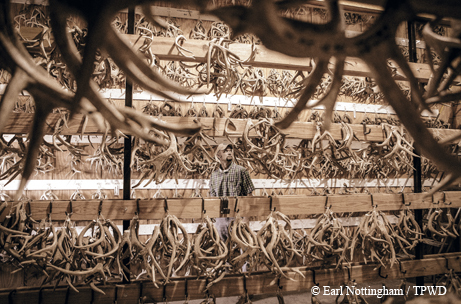 When Prohibition put most saloons out of business starting in 1922, deer antlers helped keep the Buckhorn open for business. Friedrich continued to use his still-growing collection of antlers to entice visitors. Instead of topping off beer mugs, the entrepreneurially minded San Antonioan sold lunches and nonalcoholic drinks. He also opened one of Texas’ first curio shops, a big draw being his hall of horns. Expanding on her husband’s concept, Emilie Friedrich started swapping free drinks for rattlesnake rattles — minus the snake, of course. She then transformed rattles into souvenirs that out-of-state visitors could hardly resist taking home to show how wild Texas was. 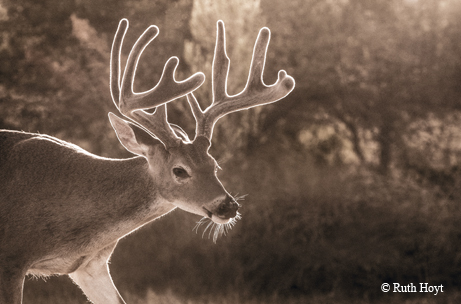 During the rut, many hunters use a set of antlers to "rattle up" another buck. Hearing the brittle clacking of antler-on-antler, a buck thinks another buck is fighting a rival for the favor of a nearby doe. Against what should be his better judgment, the opportunist buck lopes to the scene expecting to win over the fair lady only to be felled by a waiting hunter who has set down his rattling horns and picked up his rifle. And so, yet another set of antlers either goes up on the wall or gets turned into some other form of cultural artifact.